Wolves look a really good side this season after some great investment, and they’re more than matching Manchester City today with the scoreline 0-0 at half time. 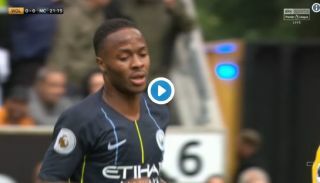 The newly-promoted outfit owe much of that, however, to goalkeeper Rui Patricio, who produced this stunning save in the video below to deny City star Raheem Sterling. If you watch from this angle it shows just how well he did to get all the way across to that side of the goal when the strike looked destined for the top corner. Patricio just got the faintest touch to tip it onto the frame and out and preserve the 0-0 score for Wolves in what promises to be an intriguing second half.
? WHAT. A. SAVE. ? @Wolves goalkeeper Rui Patricio with an early contender for save of the season from this Raheem Sterling effort! ? ?